Several tiny moons have been discovered recently, most from ground based imagery! With these discoveries, Uranus joins the jovian planets in having a number of small moons in irregular orbits. Here is more up to date data. Two new moons of Uranus, provisionally known as Uranus XVI (S/1997 U 1) and Uranus XVII (S/1997 U 2), have been discovered. The names Caliban and Sycorax proposed by the discoverers have now been officially accepted by the IAU. Caliban (S/1997 U 1) orbits about 7.2 million km from Uranus and is about 80 km in diameter. Sycorax (S/1997 U 2) orbits about 12.2 million km from Uranus and is about 160 km in diameter. These size estimates are based on their apparent brightness and assuming an albedo of about 7%. The orbits are retrograde and highly inclined. Caliban is a character from Shakespeare's play The Tempest; a savage and deformed slave of the magician Prospero, and is the son of the witch Sycorax who imprisoned the fairy Ariel for disobedience. In The Tempest, Prospero frees Ariel from Sycorax's spell and enslaves Caliban. 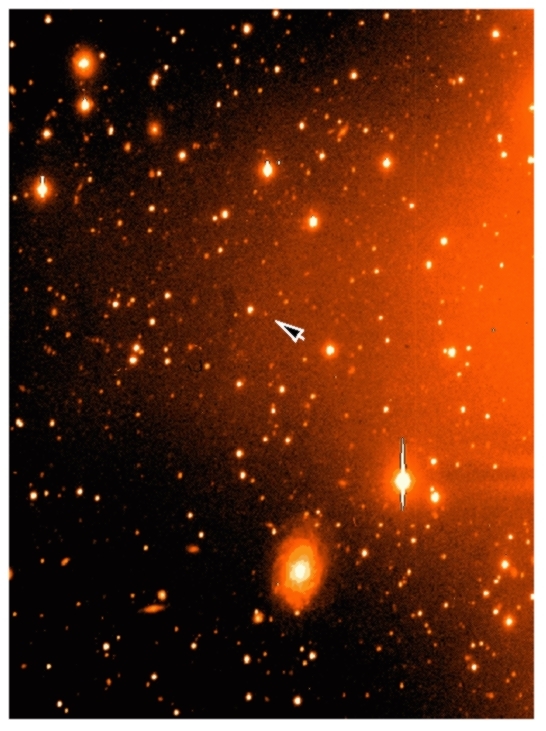 Caliban was discovered by Brett Gladman, Phil Nicholson, Joseph Burns, and JJ Kavelaars using the 200 inch Hale Telescope; the first images were taken 1997 Sept 6 and 7. Credit for Sycorax goes to Nicholson, Gladman, Burns, and Kavelaars. The image above is the discovery image of S/1997 U 1; the one to the right is S/1997 U 2. Prior to this discovery, Uranus was the only one of the gas giants not known to have "irregular" moons, that is, ones whose orbits are not direct and approximately in the plane of the planet's equator. Like the other irregular moons (eg. Jupiter's outer 8 moons, Phoebe and Nereid), these are probably captured asteroids. It is highly unlikely that they could have been formed initially in these orbits. The composition of the two moons, according Nicholson, "is probably a plum-pudding mixture of rocks and ice." Both moons are unusually red in color which may suggest a historical link with the Kuiper Belt. These are the dimmest moons ever to have been imaged with a ground-based instrument. An object designated 1986U10 was imaged by Voyager 2 in 1986; but not noticed until 1999 by Erich Karkoschka of the Lunar and Planetary Lab of The University of Arizona in Tucson. It's orbit is nearly identical to that of Belinda, about 75,000 km from Uranus. It is about 40 km in diameter. For several years after its discovery, this moon was thought to be non-existent as it couldn't be seen with Earth-based telescopes (and we have no new spacecraft near Uranus :-( But in 2003 it was recovered by the newest camera on HST. It's real after all! Observations of Uranus taken in Chile in August with the 4-meter Cerro Tololo Interamerican Observatory Blanco Telescope have revealed a probable new moon for Uranus. The object is likely 7 to 19 kilometers across and has an orbital semimajor axis of 8.5 million km. Matthew J. Holman (Harvard-Smithsonian Center for Astrophysics) led the trio of observers that made the initial discovery. The finding was announced on the International Astronomical Union Circular 7980. Gladman, Holman, Kavelaars, Petit et al have done it again. Many of these recently disovered moons are actually fainter than the ones discovered by Voyager 2. These tiny moons are also named for characters in The Tempest: Prospero is a powerful magician who enslaves Ariel; serving as a butler on Ariel's ship, Stephano and Caliban plot to murder Prospero; Setebos is the god of Sycorax. First imaged by Kavelaars, Gladman, Holman et al with the Canada-France-Hawaii Telescope on Mauna Kea in July 1999. Their orbits are uncertain at this point but are about 10 and 25 million km from Uranus. They are probably about 30 or 40 km in diameter (assuming an albedo of .07). 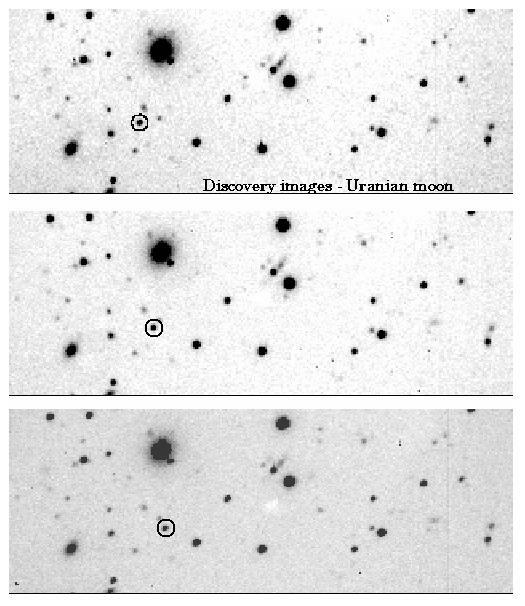 Two more Uranian moons were discovered with the Hubble Space Telescope in 2003 by Mark Showalter and Jack Lissauer. They are temporarily designated S/2003 U 1 and S/2003 U 2. Scott S. Sheppard and David Jewitt at the University of Hawaii discovered another pair of Uranian satellites designated S/2001U2 and S/2003U3 on images obtained from the Subaru 8.3m Telescope atop Mauna Kea in Hawaii. Further observations by the Hawaii team allowed Brian Marsden at the Minor Planet Center to link the object to independent discovery observations obtained in 2001 by a group lead by Matt Holman and JJ Kavelaars. The 2001 observations were not enough to determine if the object was a satellite of Uranus and no reliable orbit was found. It was then lost until discovery in 2003 by the Hawaii team. We know next to nothing about these moons; how much will we be able to learn about them until another spacecraft is sent to Uranus?